The Ministry of Communications and Transportation established 13 Pilot Training Schools before the end of World War II. 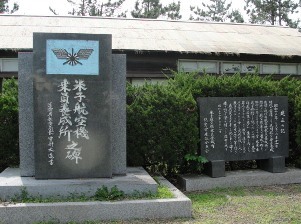 The first two, located in Yonago City and Sendai City, were established in 1938 and served as training facilities for pilots who would work in the Ministry of Communications and Transportation primarily to carry mail by plane. During the Pacific War, the Army and Navy increasingly used these Pilot Training Schools as sources for much needed trained pilots. 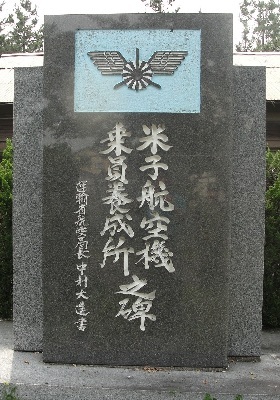 The Army ran ten Pilot Training Schools (year established in parentheses) in Sendai (1938), Yonago (1938), Niigata (1941), Kumamoto (1941), Inba (1941), Kyōto (1942), Okayama (1942), Miyakonojō (1942), Koga (1942), and Chikugo (1944). The Navy had three Pilot Training Schools in Ehime (1942), Nagasaki (1942), and Fukuyama (1943). From all of the 13 Pilot Training Schools, there were 3,200 men who graduated, received supplemental flight training at Army and Navy training bases, and became noncommissioned officers. As Japan's situation worsened toward the end of the war, 162 graduates from Pilot Training Schools died in special (suicide) attacks. On June 11, 1938, based on demand for pilots in those days, Ministry of Communications and Transportation Pilot Training Schools were established as means to provide locations for civilian aviator training. Training of pilots began and continued until the end of the Greater East Asia War on August 15, 1945. During that time over 1,000 young men shared their lives and dreamed with aspirations of flying in the skies, and over 500 men worked at the school as teachers and in other positions. We cannot contain our feelings of grief for the many men who lost their lives in battle among those who attended the school. Tadamasa Itatsu, first director of the Chiran Peace Museum for Kamikaze Pilots, entered Yonago Pilot Training School in October 1943 and then transferred to Tachiarai Army Flight School in Fukuoka Prefecture for supplemental flight training. On May 28, 1945, he took off from Chiran Air Base toward Okinawa as part of a special attack squadron, but his plane crash landed on the island of Tokunoshima before he could reach enemy ships.